My oldest son has his Eagle Board of Review tonight. I don't know who is more excited me or him. My oldest son just passed his review for Eagle Scout. As well you should be, Matt! Congratulations to the whole family as well, because I know the effort & sacrifice it takes on everyone's part to make it happen. You look like a PROUD papa and are sporting quite a bit of 'fruit salad' there yourself.....I know what that means, too. LOTS of work & time devoted to Scouting! Salutations to you all and be sure to tell your son that an OLD Eagle Scout from Nebraska is also proud of his achievements! Congratulations , to you Matt and to your son! What a great achievement! Sv: Boy Scout Leader's Coffee Corner. I didn't get to be in the scouts as a kid but a cool thing here in Sweden is that the king is actually very involved in and promotes it whenever he can. Always appreciated that about him. Anyone have any scouting news? Any questions? For the first time since 1910, the Chief Scout of Canada is not the Governor General. This year Terry Grant was named to the position. Who's he, you ask? He's better known as Mantracker. This was part of Scouts Canada's plan to rebrand as a "cool" organization. Extreme mountian biking, zip-lining, etc have combined with the popularity of outdoors "survival" shows and it's becoming cool like it hasn't been since the early sixties. My son did two years of Beavers and just started his first year of Cubs. There are about seven kids from his class at school in the same pack. They are having a blast. Even as Beavers they are camping out and as Cubs they are doing as much outdoors as I did when I was a Scout (Beaver, Cub, Scout and then recieved Chief Scout Award '87 - Canadian version of Eagle Scout, Jr. Leader and then Leader). I've seen what the Scouts at this Church do. Pretty extreme and lots of fun. Funny how parents of my generation around here are more accepting of our children being challenged than say those ten years older. I feel the times they are a changing for the better. Several years ago, the British Scout Movement named Bear Grylls as their Chief Scout. If you notice in some of Bear's Man Vs. Wild shows that he has a large World Scout Crest sewn on his right sleeve of his jackets. They tried to re-brand scouting as a "cool" organization, too. IMHO, the scouting movement is very cool. The things these youth and kids do is amazing. They have outdoor opportunities and high adventure opportunities that I never even thought of when I was kid. You do look like the proud papa, Congrats! Tonight at scouts some of the adults were talking about some challenges we put together for the boys one a outing we have next month. Some of the usual with a twist. Like burn through a string but the string is in a block of ice. Have them makes fire using only what we give them. One log and some lint. We are going to start off with a compass course to find the gear & instruction. Does any one here have ideas we could use? lgm....I just did a Google search for Boy Scout compass games and courses and a whole mess of stuff came up. You might want to try that and see if anything trips your trigger. I always liked the challenges that involved improvising a solution out of a give set of materials. 1. Have a pot with a bail sitting on a stump. 2. Tell the kids to put the pot in a box. 3. Restrictions: only one person can move the pot, he can't look at the pot and no one can be closer than ten feet to the pot or box (mark a circle around them with a rope). 4. Given: a long pole, some string, a coathanger, a compass (with a sighting mirror) and three or four other miscellaneous items. 5. All gear is to be in a random pile so that they have to work together to come up with the solution. A good story helps: That's a bucket of radioactive waste and you have to contain it in that lead lined box in the next 20 minutes. It you look at it, you'll go blind and if you get too close, you'll get radiation poisioning. Hey Yeoman... That's a good one! Another one I like is knot tying in a box. Get a banana box (or similar) and cut two holes on one side so that the kid can put his hands in the box but not be able to see them. The rope is in the box. The kid picks a piece of paper out of a hat and then has to tie whatever knot is on the paper. Yes, good ideas . Thank you wolfy & Yeoman. One of my favourite games when I was an assistant leader was the group fire. Depending on how many kids in the Patrol you assign fire lighting duties to each boy. The patrols can compete with the time to boil. I bought my friend's boys a couple of Mora's for Christmas, thinking they would be great for their Boy Scout outings. I learned afterward that Boy Scouts, at least their troop, does not allow fixed blade knives. I find this odd, since I consider fixed blades to be safer than folders. Besides kids use fixed blade knives all the time at the dinner table, and noone worries. I would like to ask the thinking and reasoning behind that policy? Punty, I really, really, really wish I could answer that for you but I can't. I've been involved with Scouting since 1979 and they were banned in my area since them. My Scout said what did we need a belt knife for: you can do everything you need to with an axe, bucksaw and jackknife. From what I have learned The BSA does not have a rule about fixed blade knives. It is left up to the troop. In our troop it is folder only and no more then a 3" blade at that. But I must confess I have cheated a time or two. That's correct, lgm.......we allow them in our Troop, BUT they are gone if misused! I am not for sure, but awfully close to thinking that Setons book has some games/exercise in it for scouts to do to practice skills & such. Or it may have been Baden-Powells..Not sure. I will go look in a bit to see if it was his book or another I have downloaded or read online that had them. I remember reading abut them quite some time ago,but can't nail down the author/book right now. Since I can't sleep right now it is something I will do to pass the time & I'll bring it here if I find it, if nothing else for future folks who may read this topic. Well, both of them had games. Setons 1911 handbook for scouts has a whole chapter of them. Chapter 8, or "Chapter VIII" in the books way of nemrating chapters, is completely games for scouts. Baden-Powell's book has games, but they are interspersed throughout the book & usually at the end of a chapter or "Yarn" as he called chapters in that book. Being private, the BSA can make whatever rules they like. I have not yet found a BSA troop that does allow fixed blade knives. They can shoot .22 rifles, and use axes, but no Moras. Thanks for the links Mnsportsmen. There is no official rule in the BSA prohibiting fixed blade knives. Although, there may be a troop policy that the scout will have to follow. The reason for the straying away from fixed bladed knives in more recent years is due to the movie Rambo in the 80's. The troops had to do something to keep the scouts from carrying huge "Rambo Knives". So anyone have any interesting questions, stories or advice etc? ? Anyone earn any awards or their children earning awards? ? when a boy leaves scouting for what ever reason what becomes of any moneys left in their account? This came up at the counsel meeting tonight. This is a very great question. It comes up alot in scouting. That being said, if a boy earns money and has money in a scout account, IMHO, it should be given to the boy when he leaves. This raises the question of profitable incomes and troops/packs say that they will only release the money to another scout unit to be used by the scout in the new unit. Lately, in my district, we have been suggesting that the burden of profitable income would be on the scout/scout parent in question and alleviate any liability to the troop/pack. Honestly, do you think the IRS will go after a troop/pack or a scout for probably not too much money? I, personally, don't think so. I can answer things in more details and give other examples but that is basically the rules. Again, a good upstanding troop/pack will give the money to the scout. After all, it isn't the troops/packs. Don't let the leaders forget that the Scout Law, one of the points being Honesty. In our troop the thinking is any monies from fund raising were raised in the name of the BSA and belong to the troop. If monies came from personal funds the scout / parents can request reimbursement. Now if the scout is going to a different troop all funds would be transfer to that troop. Keep in mind we are not talking about a lot of money most of the time. I feel their is a deference between a boy dropping out just because and something like his family is relocating. Or he received his Eagle award. I did not know the chartering organization had a say in it. I knew the equipment was theirs so it makes sense. I will have to bring that up. Thank you for the response. Yes, the Charter Organization has a say, however, most don't know they do ancd most don't know they own the equipment. They usually find out about this when problems arise. So, I finally bit the bullet and said yes. I'm currently filling out the paperwork and police background check to become a Cub Leader again. My son did two years in Beavers and started Cubs this past Sep. The Akaila is a middle aged woman who has been having some mobility issues and another leader is in the same boat. They had three young guys assisting but one moved and the other cannot attend all the time. The Group leader has been stepping in to assist but he's well into his '70s and when he found out I'm navy and a former Scout leader he applied the pressure and so here I am. I'll finish the year with the Cubs but will likely work with Scouts next year depending on my work schedule. I'd rather have my son be able to be involved independently. I had a question about BSA. What are the programs and ages there? Are they co-ed? I'm just curious so I understand your system better in discussions. In the BSA the Cub Scouts (6-11) and the Boy Scouts (10-18) are for males only (leaders can be females). However, at 13/14 there is a group called a Venturing Crew it is co-ed and goes up to the 21st birthday. Webelos (We'll Be Loyal Scouts) 10-11 The Webelo Scout can transition at 10 if they had earned the Arrow Of Light Award. Good luck being a Scout Leader! My son just finished his scouting year til Sept. 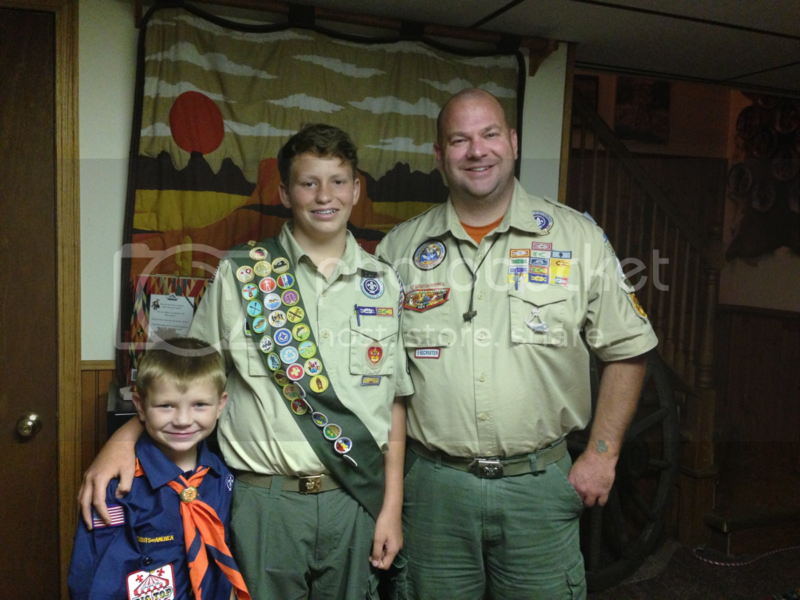 He just made the jump to Boy Scouts, earned his Arrow of Light in March. I was den leader from Wolf thru Webelos 2. I was kinda behind the scenes when he was in Tigers. When he made the jump to Boy Scouts, I took over for Bear den, whose leader wasn't able to continue. The parents asked me to go forward, so I'll be doing both Webelos programs again. Going forward, I know what to do, and what NOT to do. I'm hoping my den can meet one Saturday this summer. I'd love to start working on Outdoorsman, Naturalist, and Forester. Take them for 1 of our 3 mile hikes. See what trees, plants, animals we can see. Then back to my place, show them how to light a fire (in my pit) and then have them cook a meal. I did this with my son's den, and they wanted to cook hot dogs over the fire. I know, I know...foil pouches, egg in an orange peel, etc. The boys wanted hot dogs. It was their event. We did hot dogs. A nod to the Girl Scouts here...they DID make s' mores. My daughter just finished her scouting year as well. She was a Junior, and earned her Bronze Award this year. She'll be a cadet next year, and will be going for her Silver Award. I don't want to rush the summer, but I AM looking forward to another scouting year in Sept.
You're serving as a vital link in the chain, mckris........witho ut folks like you, I believe the organization would cease to function. Thank you for carrying on the tradition! I assume you know what troop he will be in. Here Boy scouts meet all year long. You might not have to wait until the fall for the fun to begin. on a unrelated note I was nominated into the OA. Now my son has no escape. thanks wolfy. Working with a great bunch of enthusiastic kids certainly makes it that much more enjoyable!!! he's been in the troop since march. They take july & aug off. Summer camp in july, and I believe we are doing a whitewater rafting trip in aug.
My son's pack (which I am a weeb leader in) shuts down each summer. Honestly, I gotta chalk it up to lazy leadership. My Dad is the weeb leader for a different pack and his program is stellar! No shutting down there, they run all year, lots of activities and hands on everything. I am "just an assistant" with no authority to get anything done...but, I have made enough noise to the new committee chair, I think we shall see some changes next year. We did get a new Webelo leadership team, so I'm excited to see how that goes. On the flip side, I was just headhunted from the brand-new 11 year old patrol to work with the older boys who are allowed to do soooo much more! Im uploading pics of our last outing...just came down yesterday after three days up in the sticks. Taught them to do a one-stick fire. Stoked myself that it worked: after dark, rained two days, still raining, dead wood on the ground...one match, done deal! We did the wilderness survival merit badge last month. Next month we are staging getting stranded with minimal gear and doing a real-life scenario based "wilderness survival" campout. our SPL knows, the rest of the boys do not ~he he he~. Funny...I'm glad our den breaks for summer. People go on vacation, andthe chuch where we hold our meetigs isn't air conditioned. As a leader, I enjoy the time off so I'm not spending every other minute working on stuff for our den. My daughter's girl scout troop also breaks for the summer. As far as your pack goes, I don't see how they can "cram" Webelos 1 & 2 into 1 year. Webelos IS a 2 year program. Your pack is actually going against wht the BSA has set up. Cubscouts program IS changing next year. I wish I knew what the full changes will be, because my guys will be starting Webelos 2. I hope that everything we do during Webelos 1 has a smooth transition. From what I understand, the cub Scout program is getting away from the arts & crafts, and focusing more on getting ready for Boy Scouts. Yup, thats been my argument too. As a former Scout I support your mission to get the youth outside and teach them life skills. Not only do they learn things but they also meet others and make friends. To this day I can contact a few fellas that I was in scouts with. That's awesome...just curious, how long ago were you in scouts, & did you make Eagle? FYI...Cub Scouts program IS changing next year, HOWEVER, if your son is doing Webelos 1 this year, the den has the choice to continue with the current book or go to the new program. I am den leader for Webelos 1 this year, and I plan on using the current program when my guys move up to Webelos 2. This is my 2nd time being Webelos leader, so I know what works & more importantly...what didn't. Back in the 90's, and no I did not. I got the Arrow Of Light and God And Country medal, but we moved and I never found a new group to join. How old is he and how far along the trail?